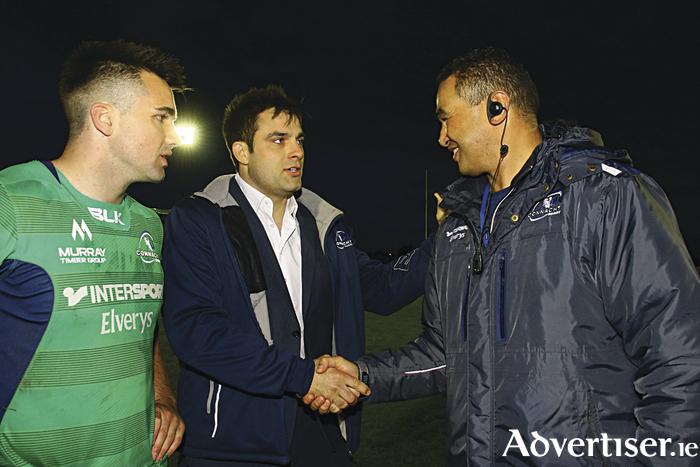 Connacht's disappointing Guinness Pro 12 season comes to an end on Saturday with coach Pat Lam urging his players to redeem themselves after their worst performance in three years. In contrast, the Welsh outfit, packed with internationals, posted four of their five tries in the opening half to secure the bonus point, while the much-changed Connacht side, with nothing at stake, struggled to cope with pace and execution of their visitors. The visitors opened with an all-too-easy try from fullback Johnny McNicholl which Rhys Patcehll converted - the only one of the evening in the difficult wind conditions. Connacht replied with a Marnitz Boschoff penalty after 10 minutes, having struck a beauty to the corner to set up field position. But within minutes the visitors had bagged try number two - a solid scrum providing the platform as their backs continued to punch holes in the porous cover. Eventually left wing Steffan Evans crossed with Patchell's conversion drifting wide with the wind. Boschoff's touch kicking ensured Connacht enjoyed their share of territorial control, while Jake Heenan and Sean O'Brien were tigerish at the breakdown, but the home side was unable to add to the score when the South African's second penalty attempt sailed wide after he was tackled high. Scarlets revelled in the space they were able to create, with McNicholl supplying Evans for the third try. Liam Williams bagged the next despite the hint of a forward pass, and Connacht found themselves behind by 22-3 at the break. John Muldoon and Quinn Roux certainly boosted Connacht on their second-half introduction, and showing patience when camped on their opponents' line, Connacht were eventually rewarded for keeping the ball in hand with Farrell sending Ronaldson through. But that was as good as it got - Patchell added a 65th minute penalty, and they finished with a Van der Mervwe try from a simple blindside move off the scrum where Connacht's defence was again found lacking. Connacht v Sarlets: T O'Halloran, D Leader, T Farrell, E Griffin, C Kelleher, M Boschoff, C Blade, F Bealham, G Heffernan, D Robertson-McCoy, J Cannon, A Browne (cpt ), S O'Brien, J Heenan, E Masterson. Replacements, C Ronaldson for Griffin ( 22m ), Buckley for Robertson-McCoy (HT ), Q Roux for Cannon and J Muldoon for Masterson (46m ), S Delahunt for Heffernan and JP Cooney for Bealham (67m ), D Poolman for O'Halloran (71m ).